Things have been busy: I got a job! I am now a part-time music lecturer and accompanist, for this semester anyway. I have three hours of lectures and three hours of coaching. The coaching is kein Problem. The lectures… well. I had a week’s notice and a very vague outline of what I was supposed to cover in the term. Luckily, I have some friends who lent me some materials and after a few days of panic/photocopying, I had something to start off with. I think it’s going to be fine. I’m only in until Easter, after which I play for everyone’s exams and then I’m done. So these days it’s very much a case of making hay while the sun shines. And, of course, it never rains but it pours: I have two recitals in February, competitions in March, two recitals in April, exams in both Maynooth university and the IT where I’m working in May. Of course, I have my own recital exam, thesis, wedding and errr, I’m trying to put together a concert series with my friends from college for June. Don’t worry, it will all be fine. Here, soothe your soul with some knitting. This is a very bedraggled-looking Harvest Moon. I am trying to knit my way through the various stratae of my stash. 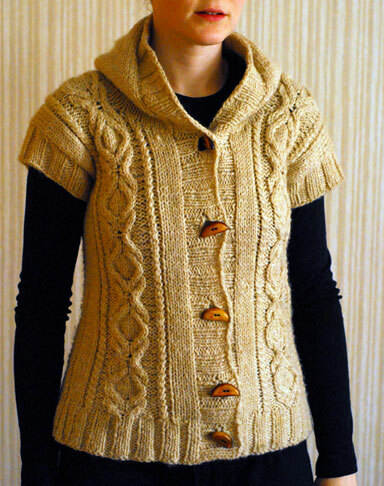 This is very old yarn (oh God, 2006!). I tried to turn it into a jumper but all I ended up with was one of those Frankenstein moments. I denied its very existence. I think this reincarnation is much better. 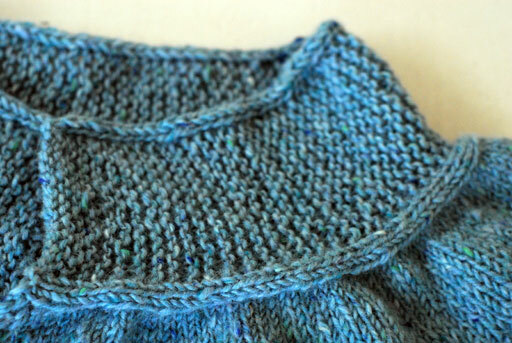 I love the collar: you work a stockinette edge on one side and it makes the curve all by itself. Then you just pick up all along that edge and continue on in the round for the yoke. I had reservations about picking up along the collar because I don’t know about you but I always find it nigh on impossible to get the number specified in the pattern. 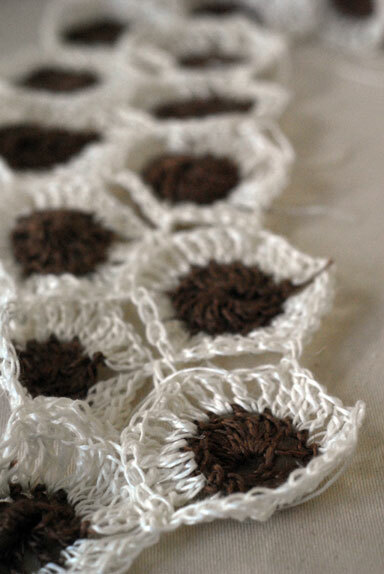 With this you couldn’t go wrong; it was simply pick one stitch for each row. The pockets were a good bit of knitting but I think they’ll be worth it. Check out the hem there. It’s a 4-stitch i-cord cast-off. I’m still not sure about it. I know it’s lying flat in the picture but when I pick it up, it rolls up at the back. I think I might take it out and put in a garter edging instead. I did it with the first cuff and I think I prefer it. I really needed some mindless knitting the other night – I had some very long days last week – so I cast on for a Hap Blanket. This was entirely thanks to She Knit Up That Ball, who cast on for one in a flurry and sucked me in while she was at it. Again, this stuff is deep stash from our 2007 trip to Donegal. I had such a good time there I couldn’t bring myself to knit it up. The cream is leftover Tivoli Celtic Aran superwash and the whole thing is surprisingly soft. I know it looks a bit small but there’s a gigantic border to go around it. It is fantastically soothing. 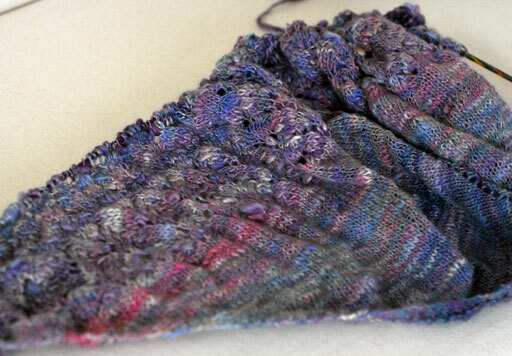 I have been chipping away at my Ishbel shawl and it is growing exponentially. …and for some reason, the urge overcame me to dig out a very old WIP. A crocheted bathmat. Very easy but there are a lot of ends. Last week was really very trying. Between two half days of lectures, I had six extra hours of vocal coaching because I filled in for a singing teacher that was sick. With all the stash knitting I’ve been doing, I thought I deserved something special for a change… and what could possibly be more special than something from Hedgehog Fibres in Cork. Beware: therein lies a rabbit hole of the yarn equivalent of chocolate cake. 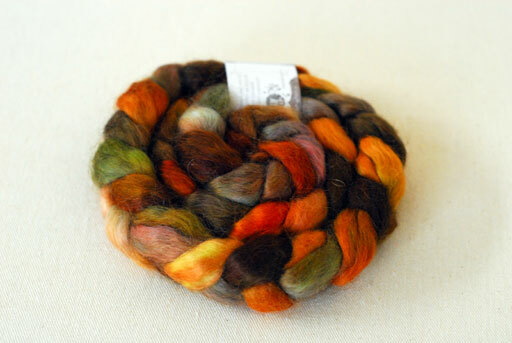 …and some mixed fibre batts – mostly merino and alpaca I think – which I think will make a nice, simple, garter moebius. Sincerely hoping that this week will be more straight forward and I get some time with Margot (my wheel). Ok! This is the last of my current finished object series. I got this blocked out and dried last week. Yarn: Malabrigo Worsted from This is Knit, in natural/undyed colourway, 5 skeins. Neither words nor pictures can convey the sensation of knitting with this yarn. Let me just say that if there was a house fire, I would take this stuff and be ok with letting the rest fry. Needles: 6mm, 6.5mm and 7mm. 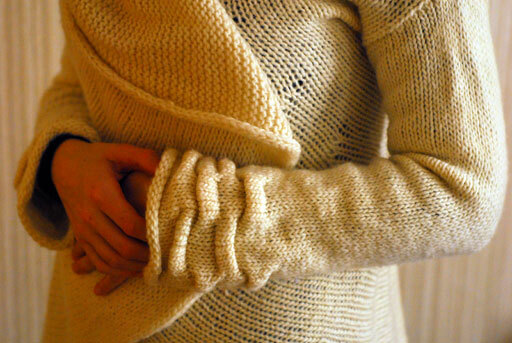 The sleeves are definitely the most fun part of the pattern. I didn’t make any modifications but I did go with the option to sew the seams on the back. I grafted the back seam initially but it looked terrible. 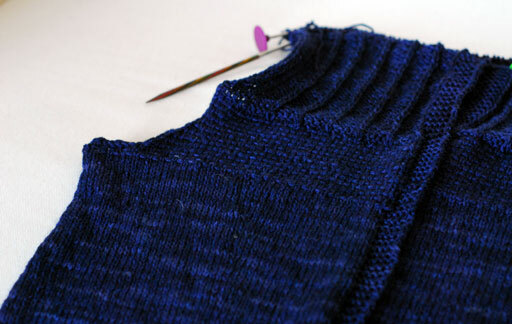 The main body of the garment is knit in short row wedges all the way around. 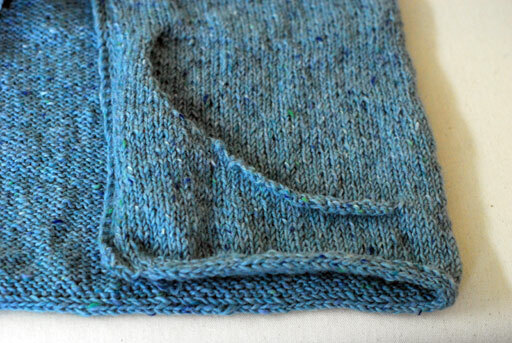 The only thing I am wondering about, now that I compare my photos with others’, is whether or not I knit too many wedges. I think I did. I was a bit spaced when I knit that part. Either way, as you can see, it makes for pretty good comfort knitting. It’s the kind of thing you pull on when you are dying from the plague, or curled up on the couch with a hot drink watching the rain fall on the window. This wasn’t in the mood to be photographed with its buttons closed properly today, so excuse the sloppiness. 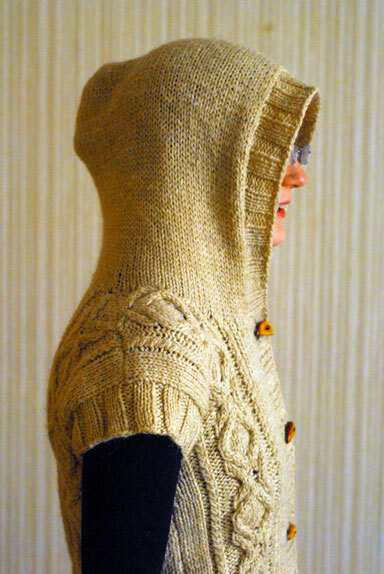 Pattern: Heather Hoodie from Knitscene, Fall 2009. Yarn: Twilley’s Purity from This is Knit, in the colour Clay, 9.5 balls. I love this yarn. I’d never used it before. It’s pretty soft for such a sheepy wool and it blocks out wonderfully. 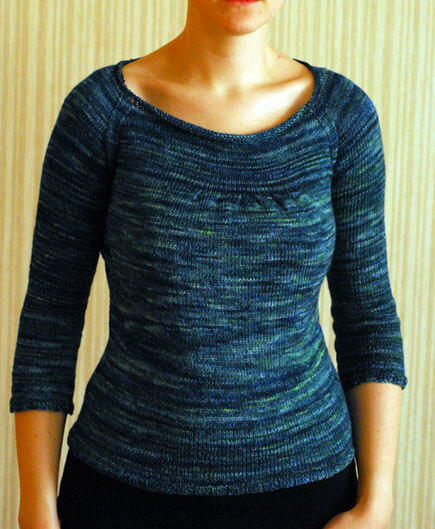 This is one of those great layer pieces that you can use pretty much all the year around. During the snow over Christmas, I wore it all the time over a lighter handknit sweater. The only thing I’m a little annoyed about is the hood. The way it’s written is absolutely perfect. I just got bored and decided I was finished with it two inches before it was properly done. It’s a bit tight when I put it up but it keeps my neck really warm the rest of the time. Buttons were from Knopenwinkel in Amsterdam. I’m thrilled to finally have knit a sweater worthy of these buttons. Such happy memories! 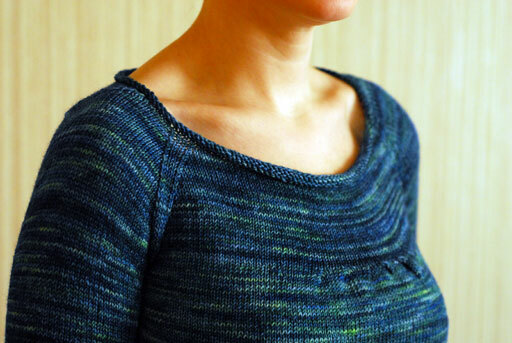 Definitely my favourite finished garment of the last while. I am looking forward to warmer weather so I can wear it. 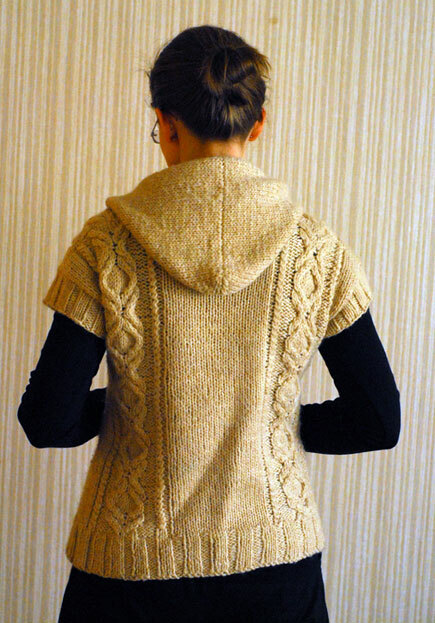 Pattern: Folded by Veera (same designer as the 2010 cardigan. Yarn: Malabrigo Sock from This is Knit, 2 skeins. Delicious yarn to work with. I was convinced I was never going to have enough yarn to finish so I kept putting off finishing the bloody thing. But in the end I had a few metres to spare. Modifications: Concerned as I was about not having enough yarn, I cast on fewer stitches. 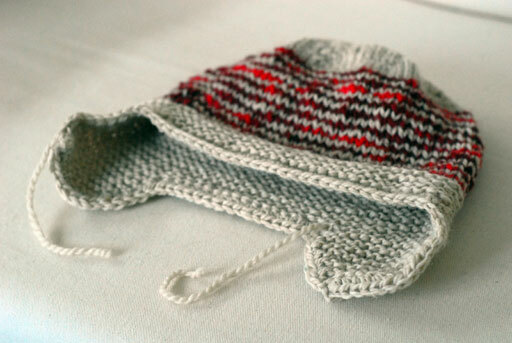 I knit the 34 1/2″ size but cast on the number of stitches for a size smaller. I didn’t really like how baggy it looked in the pictures, even though I know that was the intention. After the waist shaping, I increased to the required amount of stitches for my regular size. As you can see, I traded some of the drape of the pleats for this but I prefer it this way. 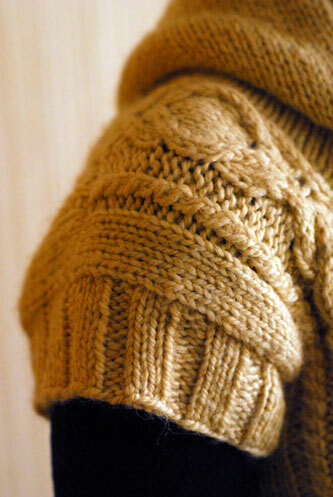 The sleeves, I knit exactly per the pattern. I’m not a fan of the 3/4 length but for this top, I think it works nicely. 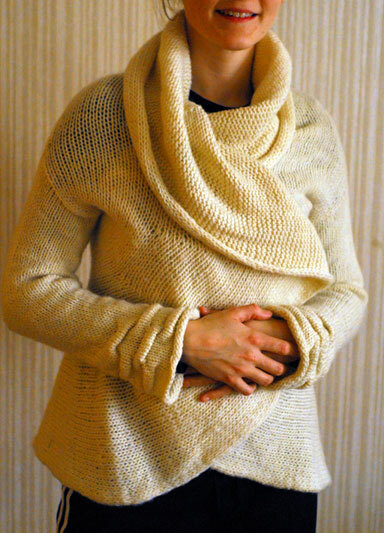 The only thing I would change if I were to knit it again is to make the ribbing longer. It has a tendency to flip up and down a bit. I went into total hibernation this week and really got stuck into some work. I’m sort of paying for it a bit this weekend but it was worth it. I’ve been working away on some things, like my Austin hoodie. This is coming along really easily. I’m nearly finished the front now and from there, I’ll be just two sleeves and the hood from a nice, wearable spring garment. I did some tidying up and while I was at it, I found some handspun that was too nice to ignore. 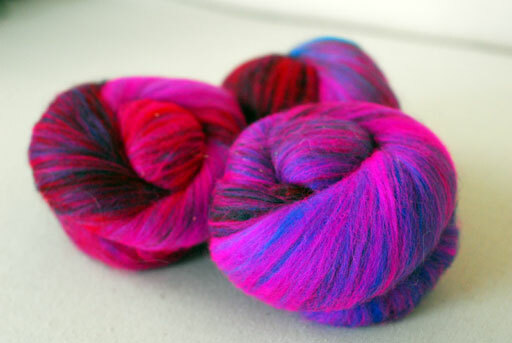 I had a huge pile of silk-merino singles from the summer. 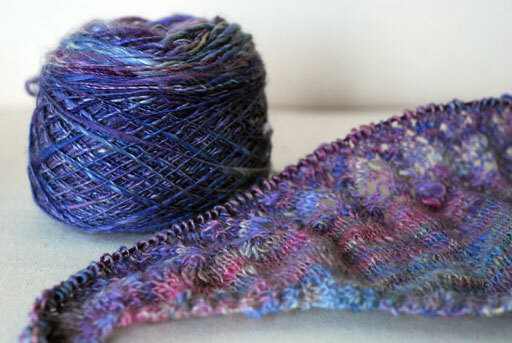 What better way to use it than for a shawl – Ishbel, another Ysolda classic. I’m pretty surprised at how… normal… it is knitting up. I always have the impression that the yarn I spin is completely unknittable, but apparently not. Yesterday was a truly attrocious day, with howling wind and rain from morning ’til night. Despite getting some work done, I felt like I never woke up properly. In that spirit, I cast on for just about the most mindless, chicken-soup-esque hat I could find. Thorpe (pdf link) has been on my wishlist for a long time. 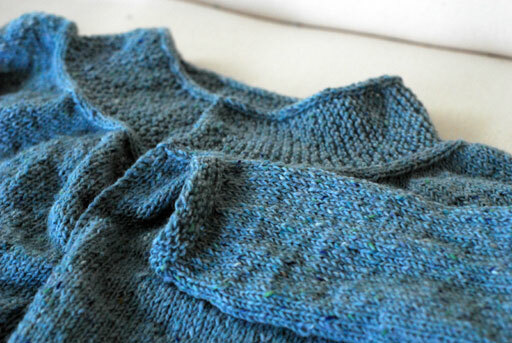 I knit this on and off yesterday evening so that’ll tell you just how speedy a knit it is. Here are the specs! Needles: 5.5mm dpns and then 40cm circular. Yarn: Leftover Twilley’s Purity from my Heather hoodie (1 ball) and Debbie Bliss Soho (long discontinued, 1 ball). 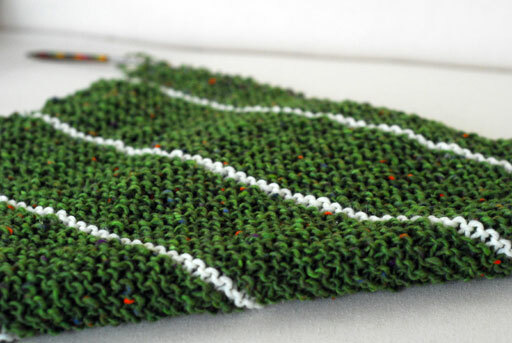 The Soho was the very first yarn I bought online along with the Denise Interchangeable needles. I got them for Christmas. I remember they were delivered on Christmas Eve and I was absolutely dying with a cold at the time. I’m going to hazard a guess that this was in 2003? Definitely time to use the yarn. I made the medium size and it fits fine. I’m going to use the remainder of the Soho and Purity to make another in reversed colours. I will probably make the small for a snugger fit. It was a lovely sunny day today and so nice to see such a stretch in the evenings already. I took advantage and got my resident photographer to take some of those modelled shots I was talking about. Stay tuned!